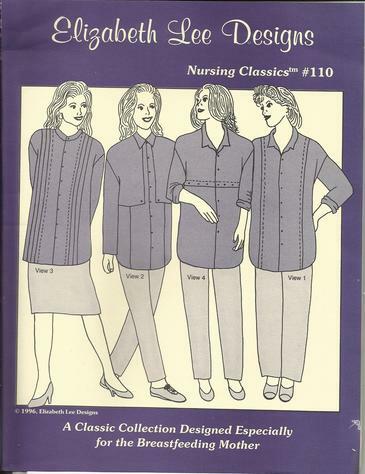 Elizabeth Lee Designs Nursing Classics #110. Copyright 1996. New old stock. Uncut. Oversized nursing shirt features basic button front styling with either vertical or horizontal nursing openings. Views 1 & 3 feature a single or triple tucked front. View 2 features a decorative caped panel to offer extra security. View 4 features a simple horizontal opening which is secured with buttons, snaps, or hook and loop tape. Special instructions are included for adapting this shirt for maternity wear. This pattern includes cutting lines for sizes 4 - 24 and is adjustable for Miss Petite. Please note: Shadowing on the back of the pattern is from the scanner. The pattern is clean.